Fill slow cooker with water. Use a potato masher to mash up all the ingredients. Cover and cook for another hour. Strain mixture several times into a pitcher using a fine mesh strainer or cheesecloth until smooth. 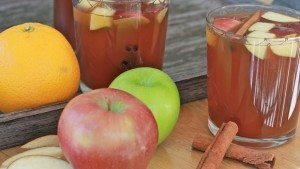 Serve steaming hot or ice cold, garnished with a fresh cinnamon stick and chopped apples. Refrigerate or freeze leftover cider.